The first big swap of the MLB trade deadline season bolsters a playoff contender while it shuts one team's long window of competing. One of the National League’s surprise contenders has addressed a key weak spot ahead of the trade deadline. According to multiple reports, the Diamondbacks have acquired slugging rightfielder J.D. Martinez from the Tigers in exchange for a trio of prospects, shoring up the middle of their lineup and fixing a problem spot in the outfield. Detroit, meanwhile, has officially made its first move toward a potential rebuild, albeit one without a clear path or future. The 29-year-old Martinez is one of the better success stories of the last few years. A 20th-round pick by the Astros in 2009, Martinez was let go after three lackluster seasons in Houston during which he posted a collective 88 OPS+ as a part-time player. Picked up by the Tigers in late March of 2014, Martinez re-emerged as a power-hitting dynamo thanks to a completely overhauled swing, becoming one of the early adopters of the now-prevalent uppercut trend. With Detroit, Martinez cranked 99 homers across three-plus seasons, earning All-Star honors in 2015. This season, Martinez is amid arguably his best year ever despite missing the first six weeks of the season with a foot sprain, with career highs in on-base percentage (.388), slugging percentage (.630) and OPS+ (167); his 1.7 WAR was fourth-best on the team. That figure is depressed by Martinez’s defense, which ranges anywhere from “mediocre” to “downright awful,” but you can’t argue with his bat. Among all hitters with at least 100 plate appearances this season, Martinez is seventh in wRC+ (162) and fifth in isolated power (.325, just a few ticks behind Aaron Judge). All of those stats make it easy to understand why the Diamondbacks made the move to get him. At 53–39, Arizona is unexpectedly in the thick of the NL wild-card race, which it leads by half a game over the Rockies. The D-Backs have a lot going right for them, namely a rotation that has risen from the ashes like a phoenix (or out of Phoenix, perhaps) and ranks second in baseball in ERA. But despite playing in the desert bandbox that is Chase Field, Arizona’s offense has lagged behind. The team’s collective OPS+ of 92 is on par with the light-hitting likes of the Braves and Angels, and the lineup has just three regulars—perennial MVP candidate Paul Goldschmidt, All-Star third baseman Jake Lamb and independent league feel-good story David Peralta—hitting better than league average by that metric. Things get even hairier in the outfield, where the Diamondbacks have gotten production from Peralta and no one else. In centerfield, franchise centerpiece A.J. Pollock has struggled after missing all of last season with injuries, hitting a mediocre .282/.333/.436 in 195 plate appearances and missing time due to a groin malady. Things have been even worse in left, where Arizona has cycled through half a dozen players who have combined for a meager .698 OPS, third worst in the NL. Regular starter Yasmany Tomas was his usual underwhelming self offensively and defensively before going down with a groin strain in early June that he still hasn’t recovered from. In his absence, Arizona turned to uninspiring options like career utility infielder Daniel Descalso, third-string catcher Chris Herrmann and cast-offs like Gregor Blanco and Jeremy Hazelbaker. Martinez will plug that hole and be a substantial improvement on Tomas and everyone else tried at that position, but he didn’t come free. To get him, Arizona had to surrender three prospects, all infielders: Dawel Lugo, Sergio Alcantara and Jose King. If those names don’t ring any bells, that’s understandable: No one in that trio made a top 100 prospect list this off-season, as all are products of the Diamondbacks’ bottom-of-the-barrel farm system. Lugo is the best of the bunch, though that isn’t saying much. The 22-year-old Dominican third baseman isn’t much with the bat and has a mere .753 OPS in Double A coupled with an overly aggressive approach at the plate, but he is a solid defender at the hot corner. Last August, minor league guru John Sickels graded Lugo as a B- prospect, noting that he has “the range, arm, and reliability to stay” at third long-term. As for Alcantara and King, both are years away from the majors: The former is 21 and still in high A ball, and the latter is just 18. Both are shortstops with little power and lots of speed, though both have gotten positive marks on their defense. That the return for Martinez is so underwhelming despite his prodigious power reflects two facts. One is that Martinez is a rental: He’s set to hit free agency after the season. And while his old team does get compensation if he signs elsewhere, thanks to the complicated rules in the new collective bargaining agreement, the best he can return is a first-round sandwich pick, and that’s only if said team is a revenue-sharing recipient and if the player signs a contract worth more than $50 million. Martinez is a lock for the latter, but Detroit has no claim to the former; had the Tigers kept him and let him walk this winter, they would have netted only a second-round sandwich pick. As such, the calculus for Detroit’s front office was likely that three mediocre prospects in hand are worth more than a future prospect in the bush. The second factor is that power, once coveted and hoarded, is cheap and easily available, particularly in an era in which balls are flying off the bat at unprecedented rates. It’s hard to imagine any team ponying up top prospects and years of future control to acquire a skill that can likely be picked up for less or dug up elsewhere, particularly at a glut position like the corner outfield. Martinez is very good at what he does, but market forces conspired to make him less valuable despite that. That doesn’t make Martinez any less of a smart or good addition for Arizona, which needed his offensive boost to keep its contention hopes alive. As for the Tigers, who entered Tuesday’s action in fourth place in the AL Central at 42–49, dealing Martinez isn’t necessarily a sign that they’re going to tear it all down, but it does throw in the towel on 2017 and close the title-contention window built by Miguel Cabrera and Justin Verlander. Most of the trade rumor attention will fall on those two players, but with both well into their 30s and still owed significant sums for the next few seasons, it’s hard to see Detroit getting all that much for them—a funny thing to consider, given that Verlander is a two-time Cy Young winner and Cabrera is a future Hall of Famer. The Tigers, then, are in a strange position. Martinez was the most obvious candidate to go, and top setup reliever Justin Wilson will follow him out of town sooner rather than later, but the rest of the roster is an awkward collection of high-priced veterans whose contracts will make it hard to move them, and lesser pieces that won’t be of much interest to any contending team. Righthander Michael Fulmer and leftfielder Justin Upton carry the most value of anyone left, but they are the players the Tigers need to build around going forward. Elsewhere in the AL Central, the White Sox have turned around their future fortunes thanks to a firesale that has seen them sell off pieces in exchange for a wealth of top prospects. Detroit’s path is harder to figure, especially given the franchise’s weak farm system—one that won’t be measurably helped by the return for Martinez. The hope for the Tigers will be to find the next J.D. Martinez—a scrap-heap pickup who turns into a middle-of-the-order star for no cost at all. 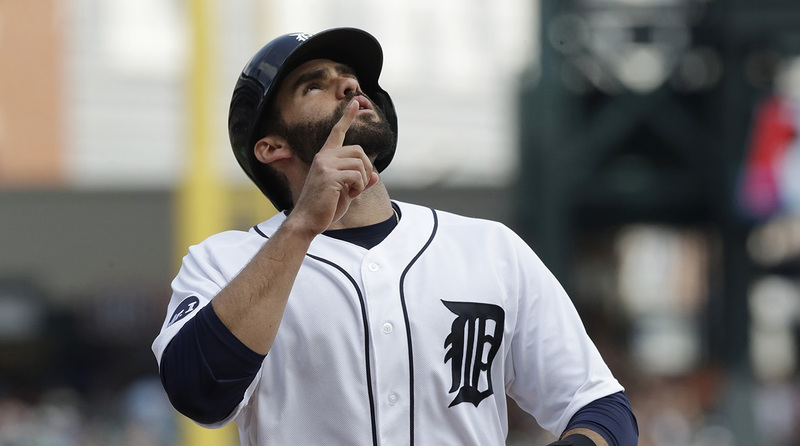 The trick for general manager Al Avila, though, will be to build a cast around that player that holds up better over the long term than Detroit’s current collection of over-30 stars. Otherwise, the Tigers will again find themselves in this same spot, and likely with a similarly disappointing result.